Image Size: 16 X 11 in. "I love to revist the times when my kids were young and innocent and liked to play make-believe," says artist Steve Hanks. This little angel is probably too young to be outside the gate by herself so she's going to hold on tightly, with both hands." Hold Onto the Gate is a darling portrait of a child's first glimpse of life outside the family. 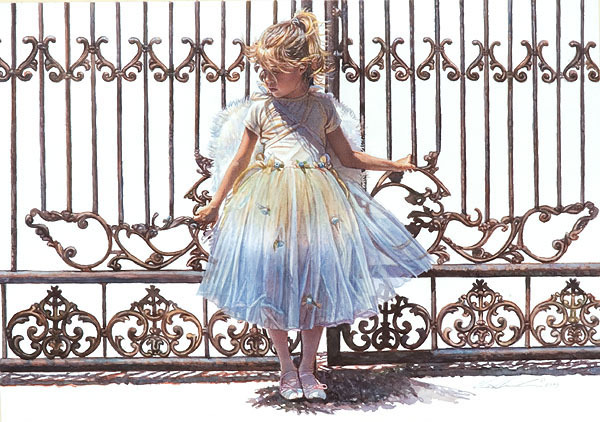 The elaborate wrought iron gate makes a dramatic backdrop to the fragility of the little ballerina standing before it. She won't be like this for long.